Hunting your Griff - Griffology...where every paw counts! “You simply cannot rush a griffon"
Jon Pease, the president of the AWPGA, agreed that the breed is not the easiest to train. “The griff is difficult to train but actually no harder than any of the versatile breeds,” he says. “You have to understand the temperament of this breed. If you push them too hard, you scrap the dog. They are a thinking breed, not a charging breed. "My dog broke because someone in the gallery was talking..."
"The judge was crowding my dog so he took steps..."
"The bird was right off his nose that's why he broke...". maybe they just haven't been trained to deal with this type of pressure. When I started training my first bird dog Charlie Williams told me something that will be with me forever - "Don't subject your dog to anything in a trial or hunt test that they haven't already experienced in training." A classic example of this is when a first time competitor enters their dog in a horseback trial Puppy or Derby stake and instead of walking their brace someone has convinced them to ride a horse (in case you don't know, walking is always an option at AKC horseback trials). Typically what you see is that after the breakaway, the dog returns trying to find their handler where they have always seen them—on the ground walking—only to find them sitting on a horse where the dog has never seen them before. The dog is confused and doesn't perform their best and the new handler is frustrated. 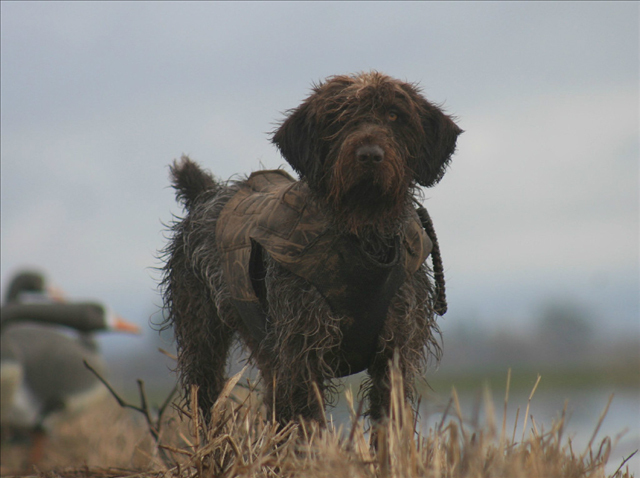 Training your gun dog to accept all types of wayward stimulus is the key. but once this has been accomplished the introduction of outside influences needs to be addressed. And now, whatever has been seen in competition should be introduced during training. During our training sessions we usually have 4 - 5 people walking with us while we're training. We encourage them to talk, make noise, laugh and carry on. And we as the handlers will often add our own comments, gestures and antics as well. We'll go so far as to step over the dog's back when they're on point, toss birds at their face, sides and from behind, even blow a whistle. Anything we can think of that will create added pressure and perhaps something that they may face during a trial or at a hunt test. If during any of this the dog breaks or otherwise "messes up," we do a correction to let them know that they need to be broke no matter what is going on around them. Certainly all dogs have their holes (things that will mess them up and get them excused from a stake during a trial or hunt test) but if you can eliminate as many of these as possible and especially those that you can train for I'm all for it. Your dogs will be better for it and you'll have more success in the field. Besides, you don't want to be that person who always seems to have an excuse as to why their dog got picked up and it was always someone else's fault. The former is just an issue of wanting to get a dog into competition before they're ready; sometimes we just can't help ourselves and we want to show everyone how well our training is coming. The latter is something entirely different. In an attempt to make sure their dogs are completely broke to wing and shot some trainers only train under "perfect" conditions - there is no outside or unusual influence (voices, noises, people walking around)introduced during training.It's a very controlled situation. However, letting go of that control—allowing noise and distraction that simulates the increased pressure a dog will experience during competition—helps insure that if anything out of the ordinary happens during a trial, everything won't break down.